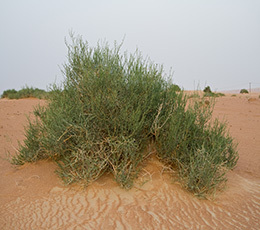 Desertification of sandy areas driven by wind erosion in the Arabian Gulf region often results in the dominance of few shrubs and grasses, while most of the land are devoid of vegetation. The impact of surviving and dead shrubs and grasses on floral diversity and plant community structure was assessed on stabilized sand dunes in Dubai Desert Conservation Reserve. Shrubs have greater role in facilitating plant recruitment and survivorship and hence enhancing floral diversity, compared to grasses. Both dead shrubs and grasses attained significantly greater species richness, abundance and diversity indices compared to comparable surviving shrubs and grasses, so the effect of dead grasses was more pronounced than that of dead shrubs. Grasses have a greater role in enhancing floral diversity after their death. For restoring the productivity and species diversity of degraded sandy desert habitats, the study recommends the maintenance and growing shrubby plants as an early successional stage that facilitate the environment of other annuals and perennial plant. This would help in stability of the fragile desert ecosystems.